Now the reason I am sticking to just food products is because the educated elite (upper middle-class, yuppie types) tend to view themselves as something far superior to the rest of the world because they can recite different champagne and wine labels and years and tell people whether it has an earthy or fruity taste. To further their snub of the rest of the world that spends more time trying to scrape enough money together in order to buy a bowl of rice to feed a family of twelve, they boast of their knowledge of exotic coffee beans and capuccino and latte combinations. So, of course, to keep up with the Joneses, the LDS community have become purveyors of the aforementioned goods. 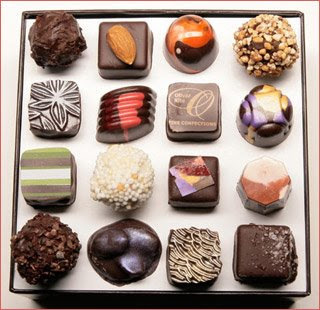 As it turns out, chocolate is grown all over the world, from Brazil to New Guinea to Aruba and refined in Switzerland, Germany, Belgium, England and the US. And of course, depending on where it is grown, it has certain flavors. Chocolate from New Guinea has a bittersweet fruity flavor, while chocolate from Brazil has a richer smoother flavor. Now I'm not going to go too deep into all of the combinations, flavors and possibilities of all of these foods, but suffice it to say, the LDS community is not missing much without wine and coffee. For instance, with juices, with just mango alone there are more types than even apples. Some exotic fruits that you may not have heard of are acerola, acai, mangosteen, ciriguela, chibutchicaba. And all have a plethora of health benefits and taste selection to offer. I'll go into more detail about this in later posts, but I'd love to hear your thoughts. Well, I know that we all have tons of spare time on our hands to read inordinate amounts of posts, articles, blogs and the like all over the internet, but I decided I'd write a little blurb just to experiment with the attention span of any of my readers. That means I am making this post short so that you all can do those really important things like add ridiculous facebook applications like 'Knighthood' and 'What Beatles Song Describes Your Life Right Now.' Wait, maybe I'm the only one who does that. Do you want to know how pathetic that is(rhetorical, do not respond)? I think that daily I sift through hundreds of news articles, blog posts and facebook profiles a day. I think for sports stories I read anywhere from 10-15, for odd news stories probably 30 or so, and for the rest (politics, world news, celebrity gossip, etc.) I usually top the 100 mark. Now you might think "How does he have the time?" Well, it's easy when you have classes that so often bore you to tears and you take notes on a laptop. Not to say that I don't also take notes, but I've learned how to multi-task. In fact, my last post on this thing was done during my Political Science class on international terrorism. There is a blog to that here It's kinda lame and jargon filled, but it's interesting nonetheless. So anyway, let me know if this post was too long for you, and tell me how much news you tend to digest daily. Or just tell me how much you read, because I'm also reading another 5 books simultaneously and just finished 'The Kite Runner' by Khaled Hosseini, which I strongly recommend. I know many of you out there know I was anything but pleased to have McCain as the "presumptive" republican nominee, but I must now come out and say, I'm okay with it now. I was bothered by McCain's attempt to allow illegal immigrants to gain legal status while millions of others who were doing it the right way got shafted. I was bothered by the fact that he has constantly plagued American businesses, especially Pharmaceuticals with anti-big business legislation. Big business is what keeps America employed (despite its many drawbacks). I was bothered by the fact that he almost defected to the democratic party. I was bothered by the fact that he had no real world economic experience. I was bothered by the fact that he's a grumpy, weird old man. However, I have now seen the light (this may have a lot to do with my options). Both Hillary and Obama want to bring socialized medicine to America. Obama has the "audacity of hope" to create 2 million new jobs in the public sector (hmmm...kinda like overtly bureaucratic poorly run nations like Russia and France). Hillary even made the comment that, "It's time for the government to fix the economy." I nearly spat out my gum. Since when does the government control the economy? Don't get me wrong, the government has certain controls over things like interest rates, trade embargoes and the like, but what controls the economy is big Joe down at the deli, consumer confidence, your investment portfolio and what color Kmart chooses to use to advertise its blue-light specials. On top of it all, both Obama and Hillary want an immediate pullout of troops in Iraq regardless of the situation on the ground. Let me get this straight. After we invaded the country, toppled its corrupt but stable regime and trudged around without a decent strategy against the growing insurgency leaving it in social and political anarchy, and finally got it right and are working to fix the mess WE caused, WE all of the sudden are going to leave. That's like me going over to my friends house, ransacking his pantry, then sweeping up part of the mess, peeing on the rest and running away. That's brilliant. That brings me to McCain. 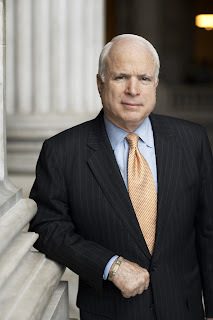 McCain is a battle-tested, torture-endured military man. He knows what it takes to win a war. He knows what it takes to survive. He sees the big picture. He wants to see more political reconciliation in Iraq. He wants to see more work on rebuilding and creating new infrastructure. He wants to allow the Generals to have the full support of the government to do what they need to do in order to bring internal stability to a war-torn, secularly, religiously and ideologically divided nation. Many might think his support of the surge is for political expediency. Others may think his support is political suicide. To me his support shows he GETS the big picture. McCain knows we erred. Hindsight is so nice. But we cannot live in the past and undo what has already been done. We need to look forward and fix what we can and leave Iraq better than we came in. On another note McCain admitted he was wrong on how he approached immigration. Good start. Hopefully he stays that way. McCain also is vehemently opposed to pork-barrel spending (all those little multi-million dollar earmarks that allow congressmen and senators to take home projects to their home states and districts with our federal tax money). This is good. We need a government that can run smoothly, effectively and transparently. We need to know where and how our money is spent. Furthermore, the correct way to slim the debt is not only through careful and well-regulated spending, but tax cuts. We should only pay what we have to, and nothing more. McCain was reluctant to call the Bush tax cuts a good idea, but now that he's latched on to them, he most likely won't be swayed back so easily (because he's a grouchy, stubborn, stick-to-his guns type of guy). For these reasons, and many others McCain has my vote. For those of you who think Obama is cute and has a nice voice, I can't really argue. Yes he's charismatic. However, he's also a socialist with staffers who worship leftist guerilla Che Guevarra. Not a good reason to vote for him. He's a political neophyte. McCain is old, wise and as stubborn as hell. I'd take that over a supple, 46-year-old shaven chest from Chicago's south side any day.